Pick up after your pet. Properly dispose of pet waste into the trash or toilet. Animal waste contains coliform bacteria, which is harmful to our health and, when washed into swimming waters, can result in beach closings. Carry a newspaper or plastic bag to pick up the waste when you walk your pet. 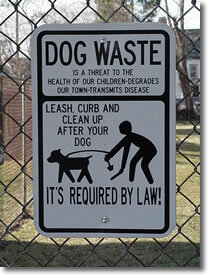 Nuisance laws prohibit you from allowing your pet's waste to remain on private or public land. When treating your pet and yard for fleas or ticks, check with your veterinarian for safe substitutes. Never dispose of flea dip liquid on the ground or in the storm drain. It should be disposed of as a household hazardous waste. Visit www.state.nj.us/dep/dshw/rrtp/hhwcps.htm for a list of county household hazardous waste disposal centers. Do not feed wildlife such as geese, pigeons, ducks and deer. Feeding results in more pollution from their wastes.